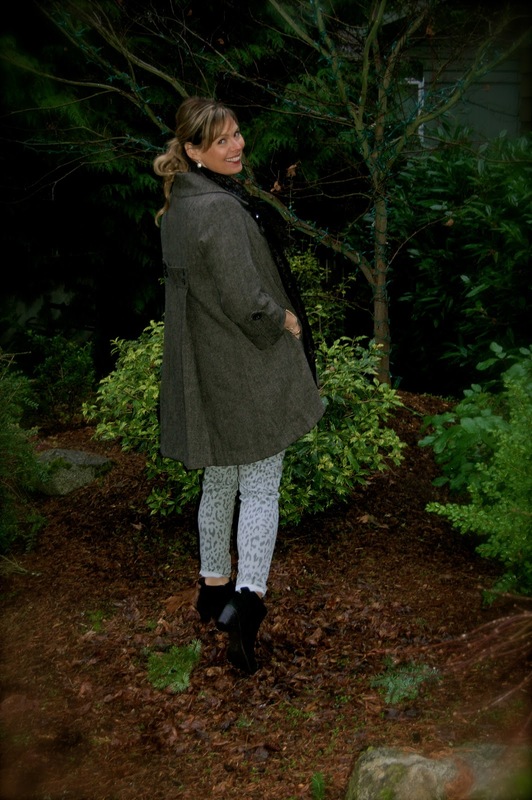 Yesterday was as grey & drizzly as ever here, but a perfect day for booties, a messy pony, and my darling tweed coat. When it's cold, often there's no sense in bothering with a cute underlayer since you never take your coat off when you're out & about. Because of that, invest in a good coat! My suggestion: Buy coats twice per year. I'd suggest once pre-season, in the summer (think Nordstrom Anniversary Sale). By the time you're aching for a new one, it's January & they're on sale again! After a couple of years, you'll have accumulated a little collection of cuts, colors, & styles, & you can purge accordingly. My tweed coat is CAbi & is 4 years old. It's got a unique shape, but isn't trendy, so it will stand the test of time (like any good investment piece should). The jeans however, supa-trendy! I adore them. Leopard print, but subtle, since they're grey. I think I was inspired by the first fashion blogger I discovered, Kendi Skeen. She takes minimal fashion risks, but just enough to be daring in an accessible way. Plus, she looks fantastic in everything which makes me think...if I put on something similar, so will I? ?